A couple of years ago I started a pair of socks. They were meant to be a birthday gift but I missed the deadline. And then I realized they were too small for the recipient anyway. I set them aside. And, you know how this story goes, right? I forgot all about them. A few weeks ago I was straightening up my craft room (not well, mind you, because at the moment that room is a disaster) but in the midst of moving things around I found the socks. One was completed and one was about 25% done. And I thought, geeez, I really should finish these but they are so small and they won’t fit me and . . . who can I give them to . . . and then I thought . . . Jessica has small feet! I had her try the finished one on that night when they came for dinner and it fit like a charm. I haven’t finished the second one yet but I’m getting closer. Maybe by next Wednesday? Love that shade of blue! What is the yarn? The pattern is really pretty too. Good for you if you can find time to knit these days – I imagine your life will be a tad bit busier than it has been in the past! Well I’ll just repeat my last comment…Go Carole Go! 🙂 Very pretty blue! Hooray for regaining a bit of knitting time now that the campaign is over, and even more cheers for finding socks that are very near completion! I love the yarn–color and squish (at least it looks squishy). I really wish I liked knitting socks. Maybe I’ll try again when I’m on summer vacation. If only I would find some socks near completion. The only odd socks I find are barely started. In the future if Jessica has a full sock drawer, I have small feet. HA HA HA HA These are lovely socks. Anytime is a good time to finish a pair of socks for someone you love! Ha! 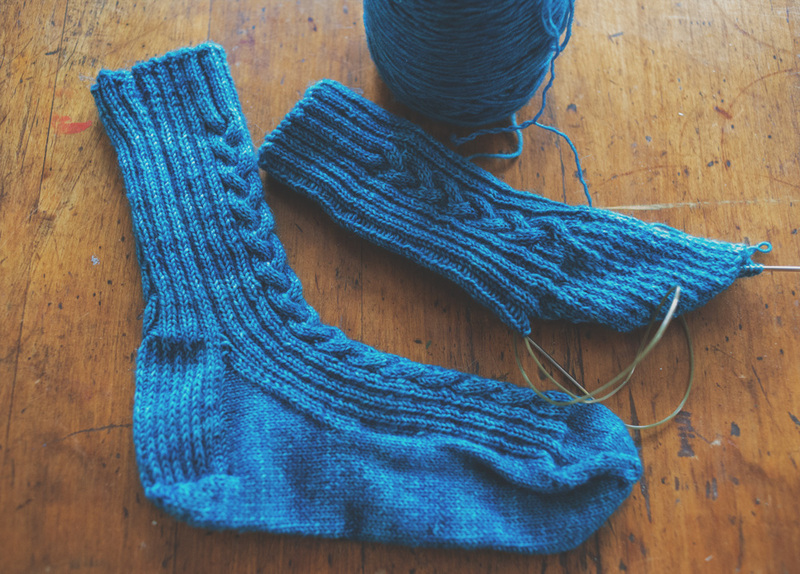 I am in exactly the same boat with the one pair of socks I have on the needles- soo close!